To read Part 1, click here. To read Part 2, click here. To read Part 3, click here. Bryan Kamaoli Kuwada believes in the power and potential of ea, of life, of breath, rising, of sovereignty, because he sees it all around him, embodied in the ʻāina, the kai, his family, his friends, and his beautiful community. He is a Ph.D. candidate in English at the University of Hawaiʻi at Mānoa, focusing on translation theory. He is currently editor of the journal Hūlili: Multidisciplinary Research on Hawaiian Well-Being, and works as a Hawaiian-language editor and translator. If some of the anti-Mauna folks writing editorials are to be believed, my Polynesian ancestors were amazing astronomers (who settled a land area equal to one third the state of New York, if it was crumpled up and scattered across 10 million square miles of the Pacific Ocean, by the way), but were too ignorant for their deep spiritual beliefs that were interwoven with and undergirding that “astronomical” knowledge to still be taken seriously in this day and age. In this ongoing fight over the telescopes atop both Mauna Kea and Haleakalā, proponents of the telescopes often try to offer us insights about our history and culture to explain why we should give up and just let them build the damn things. So many of the anti-Mauna folks want to educate us about our history and our culture, but they have little to no clue what they are talking about. Kiaʻi mauna are often described as uneducated (google “uneducated” and “tmt” to see what I mean), but the anti-Mauna people have no problem spouting off about Hawaiian culture and history or even dismissing it without bothering to do any sort of research. I have endeavored to give the definition of each name as far as it came within my knowledge of words, but in some cases this could not be done because the true signification has been lost. The ancient Hawaiians were astronomers, and the terms used appertained to the heavens, the stars, terrestrial science, and the gods. What she was referring to is the fact that there were so many terms throughout the 2,000 line chant specific to certain lineages of knowledge that she didn’t know how to translate them all. Liliʻuokalani is trying to present this information to an audience who is not Hawaiian and who has not shown itself to normally be open to Hawaiian belief except as quaint folklore. How do you explain a kilo hōkū or a kilo ʻōuli or a hoʻokele to people who are still at that time writing about how “kahunaism” and the continuation of Hawaiian beliefs are some of the main reasons for the decline of the Hawaiian people? Many in this audience didn't even think our people were human a few generations prior! For this audience, she has to equate Hawaiian practice with Western science to claim a legitimacy that proponents of Western science never gave it, except when it benefited them (see the characterization of Polynesian voyagers as astronomers above). Her brother Kalākaua, who held the throne before her, is also a great favorite of the anti-Mauna people because he was avowedly pro-Western science. And I agree that he was. He seemed to delight in all of the wonders of technology. He visited the Lick Observatory (which was 25ft in diameter and two stories high, if you were wondering), where they set up the telescope for him to look through even though the building wasn’t completed yet. He wanted an observatory for Hawaiʻi (and bought a permanent telescope that was put not on a mountaintop, but at Punahou School in Mānoa Valley). He proposed a trans-Pacific cable. He even built a model of the Nautilus from Twenty Thousand Leagues Under the Sea. What the TMT people don’t mention, or likely understand, is Kalākaua’s staunch commitment to Hawaiian traditional practices. He was a keen supporter of hula, which was still being touted in his time as one of the reasons for the decline of the Hawaiian population by people like Sereno Bishop. He had traditional mele performed at his coronation, which resulted in a court case over obscenity in the printed program. He granted licenses for traditional healers to practice lāʻau lapaʻau, for which he was also critiqued by the horrified Western medical establishment. Hawaiians attempting to revive and practice their own traditions, blending them with what they wanted from Western science and literature was so threatening to the established order, that some even felt the Hale Nauā was one of the reasons for the overthrow in 1893. The criticisms of the Hale Nauā also changed distinctly in character over time. Before the 1930s, critics only made fun of the society’s aims, but after, they derided the Hale Nauā for its scientific shortcomings in regards to the geologic age of the planet. What strikes me as funny is that, yes, the Hale Nauā miscalculated the age of the Earth in 1886, but Western science hadn’t figured it out either until 1926, and their previously accepted guesses were off by several orders on their own! Having said all this, I hope it might be a little clearer how egregious an act of appropriation it is for the anti-Mauna people to have bandied back and forth the following quote from Kalākaua for years. You can even see it below on their “informational” website specifically focused on Mauna Kea and the TMT. What the quote is referring to is Kalākaua’s excitement about the 1874 expedition that had arrived in Hawaiʻi for the transit of Venus. It is meant to show that Kalākaua’s support of the expedition and the telescope that they brought with them would translate today into support for the TMT on Mauna Kea. If we do even a little research, we can find this picture of the telescope that George Tupman, a Captain in the Royal Marine Artillery and the expedition's leader, used to observe the transit, and...well...it's little. It was set up with all of their other equipment in what was essentially a backyard adjoining a house rented from Princess Ruth Keʻelikōlani in ʻĀpua, an area just seaward of Kawaiahaʻo Church, where the shoreline used to be (Chauvin 195). There were also two small supplemental observation stations, one in Waimea, Kauaʻi, and one in Kailua, Kona. The TMT, on the other hand, is proposed to be 184ft tall and is going to cover 1.44 acres just with the buildings, and a 5-acre footprint when completed. But Hawaiians trying to make their way through a rapidly changing world while still remaining Hawaiian is not what the anti-Mauna people want to tell. 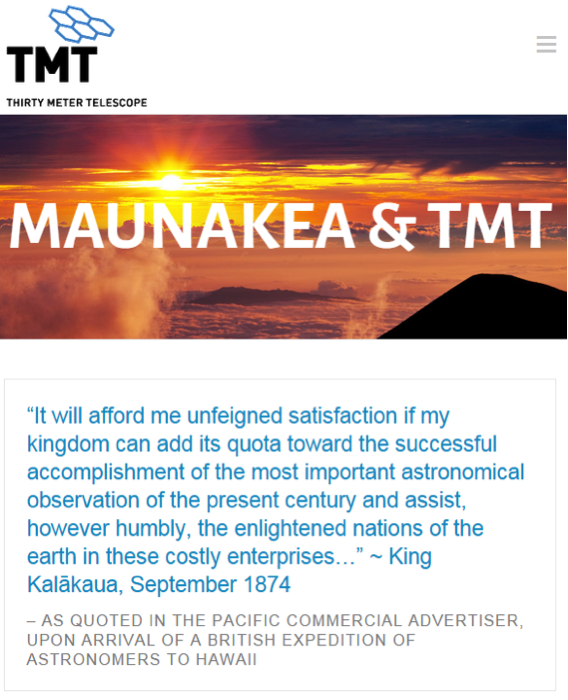 They want the story where the words of Kalākaua will enlighten the ignorant Hawaiians of today about the importance of “progress.” This same story has echoed throughout our time: How Tupman referred to Kalākaua and the other members of the royal family as "savages" and "intolerable nuisances" for wanting to have the telescope opened up to the public to look through, with Kalākaua even offering to send down the Royal Hawaiian Band to play (Chauvin 212). How present day astronomers channel Tupman when they refer to the kiaʻi mauna as a lying “horde of native Hawaiians,” a remark straight out of the nineteenth century. How in 1874, 12 marines and a sergeant were stationed around the observatory compound to maintain silence and keep the curious public out, hundreds of whom had come out in their finest clothes to witness Venusʻs transit (Chauvin 214), how in 2015 kiaʻi mauna bearing lei and mele and reverence are met with handcuffs and body armor and militarized police. We are experts at the same old story that developers, government agencies, and scientists never tire of telling, the same old story that depends on us getting out of the way of their progress, whether it be sugar, pineapple, the Puʻuloa drydock, Kahoʻolawe, Waikīkī development, Hoʻopili, every ancestral bone dug up to build a Wal-Mart, every place built on sacred land, every single telescope on the mountain. This story has had too many sequels. Too many echoes. It’s time for for more listening from them and less talking. Our story is the one where the land is our elder sibling. Our story is the one where progress isn’t progress if it is built on the backs of others. Our story is that you have much to learn from us. Our story is that we have a great fight ahead of all of us, and that each name of our ancestor we remember, each word of our language we speak, each aspect of our culture, we practice will give us strength to keep going. So if you want to tell us about our history and our culture and you don’t know our story, you better start paying attention. The site was subsequently changed and the quotes are no longer featured prominently, which I’d like to think was due to people pressuring them about their appropriation of these quotes, which may have been bolstered by a Facebook post I wrote on April 13, 2015, and a subsequent post by Kristin Momoa on Civil Beat a month later that seems to have been based on my initial post. What do the Black Lives Matter and the Kū Kia‘i Mauna movements have in common? From Hawai‘i to Ferguson to New York City, we are arriving at a tipping point. In this post-9/11 era of endless war, environmental destruction, financial crisis, and gentrification, everyday people are facing a new degree of insecurity and precarity. In response, people are rising to reclaim our land, our streets, and our lives. We are also witnessing a new round of policing and enclosure to contain these movements for justice. On August 7, 2015, the Wai‘anae Coast community (a poor and working class predominantly Hawaiian and Pacific islander part of the island of O‘ahu) hosted a community event on Mauna Kea. An audience member, Pake Salmon, asked why $1.4 billion is going toward astronomy research when we are barely surviving on the planet on which we live. UH Law School professor Williamson Chang later pointed out that we are living in a time and place in which we are mired in debt, most of us can barely afford a place to live, and it takes three hours to drive 23 miles on the H-1 during rush-hour. Not to mention that military bases continue to occupy nearly a quarter of O‘ahu’s land. Hawai‘i is becoming increasingly unlivable, and, in response, Kānaka Maoli (Native Hawaiians) are rising up to reclaim their lands and lives, a driving sentiment behind the Mauna Kea struggle. People brought this movement to Waikiki streets on Sunday, August 9, when thousands dressed in red participated in the Aloha ‘Aina march. In addition to the protection of Mauna Kea, demands included the protection and promotion of sustainable agriculture, specifically crops that do not rely on toxic pesticides and genetic engineering. After the march, community leaders spoke out against the hypercapitalism advanced by the Trans-Pacific Partnership and the illegal overthrow of Hawai‘i’s queen in 1893, calling for Hawaiian independence. Some wore T-shirts memorializing Kollin Elderts, an unarmed 23-year-old Hawaiian man, shot and killed by Christopher Deedy, an off-duty federal agent, in a Waikiki McDonalds during the Asia Pacific Economic Cooperation meeting in Honolulu in 2011. After he shot Elderts, Deedy claimed he was "protecting" the other people in the restaurant and was acquitted of his crime, despite the fact that witnesses say he was drunk. So far, five people in Hawai‘i have died at the hands of the police this year, including a man tasered to death on March 16, 2015, which the Honolulu medical examiner ruled a homicide. Across the world, police are increasingly using militarized law-and-order tactics to maintain racial and economic hierarchies in the name of “public safety.” According to an arrestee at the August 7 Wai‘anae event, the number of arrests conducted by the State of Hawai‘i’s Department of Land and Natural Resources (DLNR) enforcement officers at Mauna Kea has reached 70. Hawai‘i Govenor David Ige signed new “rules” on July 10, blocking their access to the road at night and forbidding tent and other camping structures. The enforcers of these arrests and rules are the Division of Conservation and Resource Enforcement (DOCARE) officers of the DLNR who have “full police powers [to enforce] all State laws and rules involving State lands, State Parks…as well as…county parks.” In Hawai‘i, DOCARE officers police conservation areas, and they are increasingly harassing subsistence practitioners in places like Ka‘ena, a fishing ground on the westernmost tip of O‘ahu. Many people in Hawai‘i—from fishers to hunters to activists—have remarked recently that DOCARE’s policing has amplified in recent years (even though one officer cried as he made arrests on the mountain summit). Lori Halemano, one of the arrestees from Mauna Kea, confirmed this amping of policing when I spoke to her after the Wai‘anae event. When I asked her why, she replied: “people are rising up.” They’re learning about Hawai‘i’s history and the ongoing illegal occupation and joining the struggle for Hawaiian independence. As DLNR and DOCARE claim to “protect public lands” through the arrest and removal of protestors who are challenging the very meaning of this concept, we must acknowledge that a major function of policing is the containment of the real threat that a movement of people pose to an existing social order. Shelley Muneoka of the KAHEA: Hawaiian-Environment Alliance stressed to the Wai‘anae audience that the Mauna Kea struggle is about who has the power and authority to decide how land is used. Similarly, the Black Lives Matter movements in places like Ferguson, New York City, Charleston, Baltimore, Texas, and Oakland are fundamentally about who has power and authority over our streets, lives, and living space. As a diasporic woman of color from Hawai‘i who lived part-time on the islands over the last couple of years while making my primary home in Brooklyn, I see that both movements can learn from each other. For the movements against racist policing in United States urban centers, we must align ourselves with movements for indigenous self-determination, and the understanding that our relationships with land are fundamental to all of our survival. For the movements in Hawai‘i, we must acknowledge that we are fighting the same military and police machinery that working class people of color in the U.S. are up against, and we are not alone in our fights for justice and self-determination. Laurel Mei-Singh is a doctoral candidate in Geography at the CUNY Graduate Center earning a certificate in American Studies. She was born and raised in Honolulu near the base of Leahi (Diamond Head) and currently lives in Brooklyn, New York. Until early April when the first arrests happened on Mauna Kea, I was entirely uninvolved in the issue, despite having witnessed my friends and classmates protesting the desecration on the University of Hawai‛i at Mānoa campus back in the fall of 2013. Since my support began by writing and blogging for one of the Mauna Kea protectors’ media outlets, I have made so many new connections in this movement to protect Mauna Kea and in the over-all Hawaiian sovereignty and independence movement. There is always the question of positioning and voice (and when not to have one) in this discussion. In the Facebook groups and in articles written, many state their ethnic background and connection to Hawai‛i before giving their opinion. Some Kanaka Maoli commenters then say there is no need to always mention this as a defense for speaking on Hawaiian matters, it’s “a kākou thing”. However, I find it is actually necessary as a sign of respect, as well as a statement of solidarity and mutual understanding. Over and over again by the TMT and the media, the Mauna Kea protectors are described as a small group of dissenting and “backwards” Native Hawaiians, indigenous people protesting for their privileges and rights to animistic beliefs and practices. A small group of people putting “religion” before “science”, and “progress”, while the reasonable majority supports the TMT. Anyone who actually cares to be informed and doesn’t simply accept the racism and American imperialism perpetuated, knows how large the group of protectors on the ground and in virtual space are. This is not at all about being “anti-science”, but about standing for what is pono. The authors of many of the articles written or even those standing in the line of arrest are academics from the University of Hawai‛i and other universities, Kānaka Maoli or not, scholars of social studies or law, astronomers, engineers and other scientists. The protectors and community organizers online are based out of the US continent bringing in their kuleana, their responsibility for taking care of the ‛āina, long-distance. This is where I state my positionality of not being Kanaka Maoli or even living in Hawai‛i at the moment. My motivation for joining in the kākou, the ‛ōlelo Hawaiian inclusive “us” pronoun against the pro-TMT “them”, is not only from answering the call of support from my friends in Hawai‛i, but even more, from feeling the need to step away and speak up against the group with a settler colonialist mentality counter to the protectors and aloha ‛āina. Based on my ethnic appearance (Filipino/Chinese/Spanish and German) and a perhaps more culturally-aware outlook from Pacific Islands Studies, I’m more often than not Othered or invited into the kākou anyway. Although I hold an even more unusual position in the movement, as I can’t be called a settler colonialist “ally”, as much as I am merely a malihini, a visitor, since I am without any immigrant status to the Hawaiian Islands with my EU passport. Because I’m aware that I’m an outsider, not native, not “local”, I recognize I shouldn’t confront any Kānaka Maoli who are against the protectors. I would be a hypocrite and just as paternalistic as the pro-TMT crowd that claims they know what is better for the people indigenous to the land, than they can know for themselves. Fortunately, because I’m also not white, I don’t get called haole or fear falling into a white savior complex either. Holding this middle ground or more nebulous position between Kānaka Maoli and settler colonialism, I chose my involvement. I choose to protect Mauna Kea with aloha ‛āina as the essence of respecting the culture and people indigenous to the Hawaiian archipelago. Expressing aloha ‛āina, standing for Mauna Kea, protecting sacred spaces and showing awareness and understanding of the injustice, that is what is pono for Hawai‛i. It’s what is right. I have since learned that aloha ‛āina is not only the “love of the land”, but can also be translated to “patriotism”, a word of pride for US Americans. Aloha ‛āina is what separates the kākou from “them”, either you respect it or you don’t. It might be the biggest cultural misunderstanding for settler colonialists in Hawai‛i towards Kānaka Maoli who regard and care for the land as family. Either you support what is pono, or you respectfully know your place and know that to perpetuate the colonial narrative of violence and oppression is against the life of the land. April 2, 2015, and the arrests of 31 protectors were covered by the mainstream media and social media when prominent supporters raised awareness to what was going on. June 24, 2015, and the arrests of 12 protectors were witnessed by over 700 people and private and independent cameras to counter the local media that has their own biased depictions. My own awareness was raised in October 2013, when I first saw my personal connections involved. The aloha ‛āina protectors of this generation know there were always protests against the TMT project and previous observatories constructed on Mauna Kea over the decades, only now the voices are becoming louder. As a malihini I feel it is more of my kuleana to call out fellow malihini. Kānaka Maoli have no kuleana or obligation to educate or “enlighten” visitors who don’t care to understand. My purpose for writing this and other articles is not to speak for Kanaka Maoli or to give myself the title “ally”, my purpose is to clarify to settler colonialists, haole, malihini, that this is not an “us” against “them” along ethnic lines, but a division by aloha ‛āina. My intention is to show to “them” that there is a greater movement happening that they are not seeing. The protectors are not only sustained by the pōhaku in the road and by the strength of the koa that the warriors emulate, but also by the people who give their signatures on petitions and the hashtags of #WeAreMaunaKea in virtual space, and by the generations of kūpuna standing with them in the spaces (maybe as star particles that the astronomers hold so dearly) between the lines with the love of family, the aloha for the ‛āina. Karin Louise Hermes is currently based in Berlin, Germany, 12 time zones away from Mauna Kea, to get in touch with her native German roots while writing on aloha ‛āina. She holds a B.A. in Cultural Anthropology and Sociology from the University of Heidelberg and an M.A. in Pacific Islands Studies from the University of Hawai‛i at Mānoa. I remained quiet when I read Diana’s initial posts praising her mother. I remained quiet (for a few hours anyway) after Diana commented on my post, informing me that her mother, a white settler working for the University, knew more/better than I, a Kanaka Maoli scholar and activist. I politely answered Diana’s post, letting her know that I was, in fact, quite well informed, and then asking, “I wonder why you'd suggest I'm being misled, rather than it is you (or your mom) being misled or unaware of ongoing indigenous struggles to protect Mauna Kea?” And then I went to bed, raging, hurt, offended, and overwhelmed by that familiar feeling of erasure. This is how whiteness works. The next morning’s replies from Diana showered me with more “lessons” on (1) her mother as a “Christian and community liaison” (therefore a “good guy” and someone whose understanding was more complex than my own), (2) the fact that “many many Hawaiian residents, 100's more than those protesting have decided this is good for Hawaii” [sic], and (3) how disappointed she was in my “refusal to participate in conversation” regarding the TMT (translation: my refusal to agree with her interpretations of the project). My response to her? “What you have described here is the greatest example of settler colonialism I have ever seen.” And then she was silent, and my motivation to keep Mauna Kea in the spotlight here in California, across my social and academic networks, was renewed. This is how resistance begins. I am writing this post today as a Kanaka ‘Ōiwi in diaspora, far from home, and never having set foot on Mauna Kea, nor Hawai‘i Island, for that matter. From where I sit, from this distance, I interpret the mainstream discourse around Mauna Kea, the TMT, and the protectors as yet another example of the cause and effect of centuries-old erasure of the Hawaiian people and our culture. As many others have noted, opponents of the TMT are caricaturized as stuck in the past, anti-science, and band wagon activists, and we are discursively reduced to misguided hordes of angry natives getting in the way of progress for no good reason. The growing movement to protect Mauna Kea is a refusal of this discourse, a refusal to be silenced, and a demand to be heard in a digital age wherein our names and our voices can no longer be hidden away and ignored. It is also important to note that the refusal and resistance we see today is not new, nor is it a hasty, last minute response (as many critics have claimed). Our resistance is more broadly visible outside of Hawai‘i, thanks to social media; however as Goodyear-Ka’opua, Hussey, & Wright demonstrate in their edited anthology, A Nation Rising: Hawaiian Movements for Life, Land, and Sovereignty, Hawaiian resistance to settler colonialism (and to all thirteen other telescopes on Mauna Kea) has been a relentless force for centuries. In writing about the resistance at Mauna Kea, I can only speak from this distance, which at times feels immeasurable. I cannot speak for Ku Kia‘i Mauna, the protectors on the mountain, though I would like to speak to them and reflect back across the Pacific what their efforts mean to those of us far from home and family, assaulted by American entitlement toward Hawai‘i as their perfect paradise, rendered invisible and ungrounded again and again. I am speaking now to the aloha āina warriors, to those who were arrested yesterday and removed from the mauna due to the governor’s invention of new rules, to those who have worked to bail out and legally defend the aloha āina warriors, to those who are still on the mauna, to those who have advised and enforced kapu aloha during this ongoing struggle. I want to tell them that their perseverance gives me sustenance, and their love for the land and the people overwhelms me with emotions almost impossible to contain. I want to tell them that they are not merely protecting one mountain, but they are breathing life into our people, at home and in diaspora, filling us with a renewed sense of self that is so clear and deeply rooted that it leaves no room for the false narratives, nor the attempts at erasure and engulfment by settler colonialism and Americanization. Witnessing the movement grow and spread across the globe makes me indelibly “real” again. I am no longer silent, invisible, or necessarily rendered white. I am Kanaka Ōiwi, and I am Mauna Kea. Kū Kia‘i nā Mauna. Kū‘e! Natalee Kēhaulani Bauer is a Kanaka Maoli (Native Hawaiian) doctoral candidate in Social and Cultural Studies in Education, at the Graduate School of Education, University of California, Berkeley. She is also a part of the Designated Emphasis programs in Gender, Women, and Sexuality, and in Critical Theory. Outside of academia, Natalee was a public school teacher and administrator for ten years, she is a brown belt in Kajukenbo Kung Fu, and most importantly she is mommy and favorite playmate to the world’s funniest 2-year-old boy.